The new Filestack Content Ingestion Network will dramatically increase speed for users uploading files from any region in the world. Normally, when users upload files, you have to wait until the file is uploaded to your storage before you can access it. Only once the file is stored properly in its destination (with services like AWS, Microsoft Azure, Rackspace, Dropbox, or Google Cloud Storage), you can retrieve the file for use in your application. Options for optimizing for content delivery after storage are common, using a CDN, etc., but for platforms handling user generated content, there is even more opportunity to optimize for speed on the upload front. To upload a 100MB file from Germany to Tokyo can take up to 60 seconds, even when using file uploading best practices. But with the Filestack Content Ingestion Network, that same 60 second upload for a 100MB can be reduced to 6 seconds. And a 3MB file? Less than 1 second. Every. Single. Time. With the Filestack CIN, you do not have to wait until the file is stored in its final destination before using it in your application. Upon upload, the file is stored in the nearest Filestack Ingestion point-of-presence (POP), and a file URL (filelink) is generated almost immediately for your use. While you access the file, it uploads asynchronously to its final destination. A webhook is sent to you notifying you that the file is stored properly, and your filelink automatically adjusts to point to the permanent cloud storage location. To test the impact the Filestack CIN has on accelerating file upload speed, we tested regular and accelerated uploading for different file sizes (3MB and 100MB) uploaded from two locations (US East and EU West) to store in various locations (Oregon, Ireland, Tokyo, and Sydney). Please note, these results will vary depending on network conditions. We found that although regular upload times vary in speed depending on location and network conditions, accelerated uploads are consistently fast. The only determining factors are file size and distance to the nearest Filestack Ingestion POP from the upload location. This means no matter where your users are in the world, and no matter where your storage destination is, you will consistently experience fast file uploads. We see the new Filestack CIN as a game changer for file uploads, having the same impact for file uploading that CDNs have had on file delivery. We live in a world where user generated content is being created at a rate of 2.5 quintillion bytes of data per day. Optimizing the experience around photos, videos, and files has never been more important, and user upload speed is just as important as page load time. 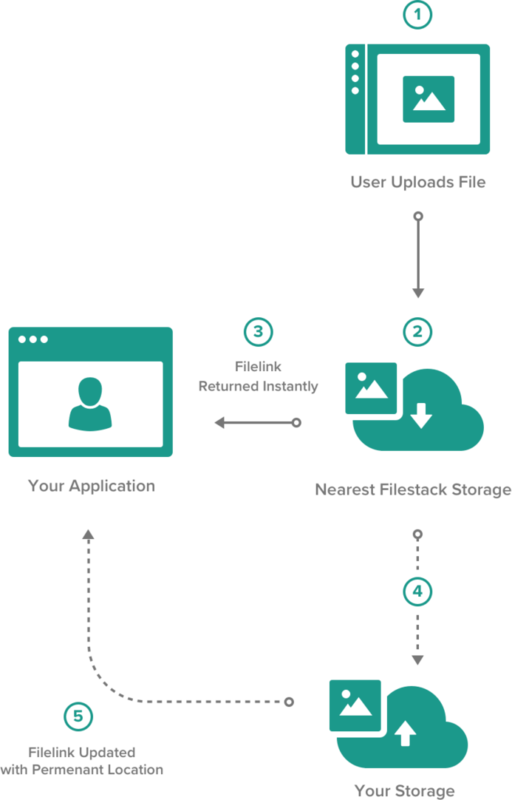 The Filestack CIN is the best way to drive upload performance of your digital assets to deliver a world class user experience for your brand. Getting started is simple. Filestack users have the option to add the Filestack CIN to their configuration, with minimal changes on their part. Please reach out to discuss pricing and enabling the Filestack CIN. If you are not yet using Filestack, you can try us out with a free trial, and then contact us about enabling the Filestack CIN. Please don’t hesitate to reach out with any questions or comments.